The Kodak camera, the brain scanner, the steam turbine, the telephone. Inventions like these not only changed the course of history, but also our understanding of what the human race could achieve. Since its publication in 1990, Making the Modern World has served as an exquisitely illustrated guide to this remarkable history of human innovation. The second edition of Makin The Kodak camera, the brain scanner, the steam turbine, the telephone. Inventions like these not only changed the course of history, but also our understanding of what the human race could achieve. Since its publication in 1990, Making the Modern World has served as an exquisitely illustrated guide to this remarkable history of human innovation. The second edition of Making the Modern World takes its readers up to the present day, with insightful discussions of the new technologies we already take for granted—from IVF to the Internet. Organized chronologically, the book begins with a look at the navigational tools that mapped the New World, such as the octant and the chronometer, before moving on to the steam-powered factory machines of the Industrial Revolution, the life-saving medicines of World War’s I and II, and the dynamically designed consumer goods of the 1950s and 60s. An essay about each invention is written by an expert in the field and includes a short history of its creation, use, and significance—and is accompanied by a specially commissioned color photograph as well as supplementary archive photographs in black and white. 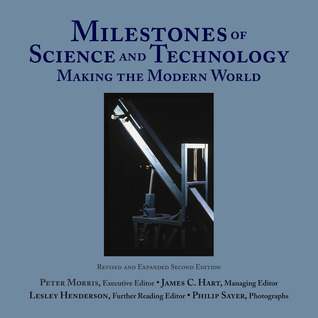 Edited by Andrew Nahum, curator of technology at London’s Science Museum, Making the Modern World will be fascinating reading for anyone interested in new developments in science and technology. Its colorful images and concise descriptive text, moreover, make this second edition an unrivaled reference for the budding engineers and scientists among us.